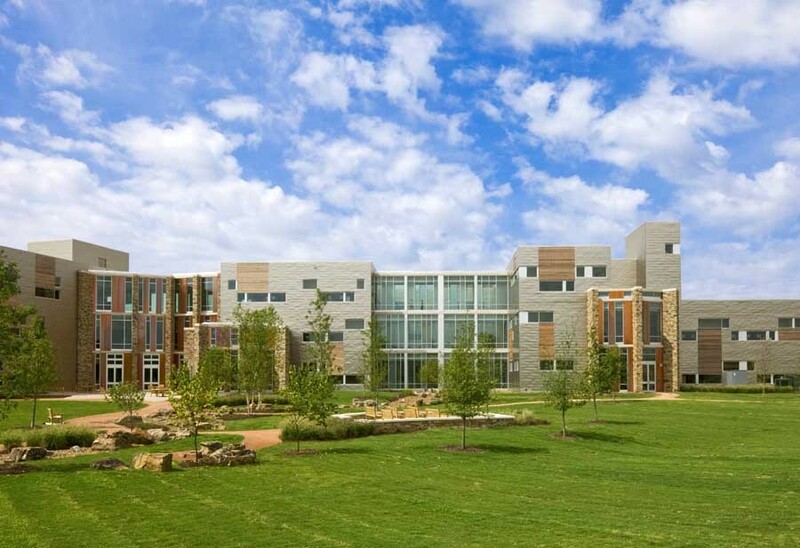 This 358,000sf replacement hospital sits on a 230-acre rural piece of land outside the small town of Ada in central Oklahoma. The site, part of Native American tribal lands, is a beautiful landscape framed by a riparian zone with a thicket of trees to the east and the swell of a modest hill to the west. Between is a broad meadow dotted with mature pecan and live oak trees. The new medical center is stretched long and thin parallel to the meadow with generous views southwest to the hill and northeast to the creek bed. It was designed around six mature trees that frame the approach to the center. Native American culture emphasizes nature as something requiring respect and appreciation. The architecture for the new health center aims to incorporate the beauty of the site as well as deference to its ecology. Existing contours, vegetation, soils and plant materials were seminal design determinants. Massing, orientation and overall building conformation were shaped jointly by external forces of the site and internal functional and operational requirements. An experience of natural beauty is seen as a means toward healing in the project, and the landscape’s serenity and peacefulness is embraced fully in the character of the building. All patient rooms are given generous landscape views, uncluttered by roads, cars or other such intrusions. Windows present panoramic connections to the land and the sky. For this rural Native American culture, their roots in the landscape are maintained even in this necessarily large building type. The whole site is seen as a healing environment, not only for the patient, but also for their families and other visitors. There is no explicit or artificial “healing garden” but rather a whole series of landscape spaces for rejuvenation. Public spaces open directly onto a meadow with trails and paths that lead throughout the larger site. The chapel acknowledges spiritual rituals that need to take place outdoors as well as indoors. The landscape quality of the site is kept simple and natural. Restored native grasses extend the character of the meadow right up to the building. Specimen trees become landmarks and precious objects. Only in a few special zones near entry points is a more “cultivated” landscape character introduced. Colors, textures and materials of the building extend qualities in the native vegetation so that landscape and building have a powerful dialogue with each other. Stone outcroppings on the hillsides around are reflected in the building’s stonework. The tawny tans and grays and the silvery sheen of the native grasses in the summer are complementary to the colors and surface character of the weathered copper and lustrous aluminum shingles. To preserve the connection to landscape on the two long faces of the building, necessary service functions were restricted to its short southeast end. A drive for ambulances and delivery vehicles, separate from the patient and visitors’ entry, limits “back-of-house” intrusion onto the site. The medical center thus has two long fronts—one facing the hill, the cluster of mature trees and vehicular access for visitors and the other facing the creek, the thicket and meadow views. A lively public space referred to as the “town center” occupies the mid-point of the building and separates hospital functions to the southeast from clinic functions to the northwest. This is an important civic venue for the entire Chickasaw nation. Since the medical center is the largest public facility supported by the Chickasaw government it needed a strong civic component. The town center becomes a meeting place, a source of information about health services and an emblem of the Chickasaw Nation’s commitment to universal healthcare and the well-being of its people. A large dining hall is placed just off the town center as a means to produce an everyday liveliness that compliments the room’s symbolic presence. 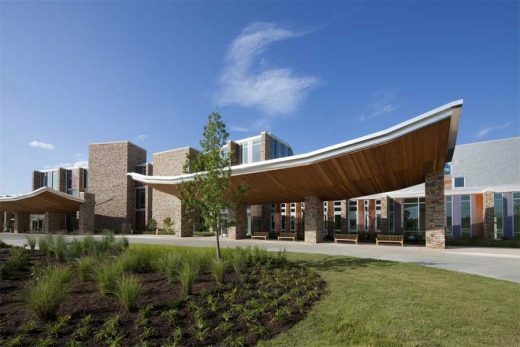 Bridges linking the hospital and the clinic span both ends of the three-story high volume with clerestory windows above introducing generous natural light. The long northwest wall of the space features exhibits on Chickasaw history and culture. For the Chickasaw people, caring for the ill is a community function. Rather than the two or three family caregivers that might be expected in a normal hospital environment, there may be a dozen or so extended family members who come from many miles away to provide comfort and assistance. Larger visitor spaces in patient rooms, pleasant community rooms on the patient floors as well as the central gathering space in the town center all provide for the larger community’s participation in healthcare. Even in site development, special trails, picnic areas and long term parking accommodations are aimed to make it easier for caregivers to spend long periods of time at the medical center. Design of the patient rooms not only makes special provisions for extended family, but also pays particular attention to the experience of a person spending a prolonged period of time in bed. The room is designed for a horizontal person, acknowledging that the perspective of a person lying down for most of the time is very different than that of the more normal circumstance of sitting or standing. Ceilings are raised from nine feet for part of the room to twelve feet near the window. Windows are extended up into this space so that a person lying on the bed can look up and out the aperture. Walls are canted in the room so that the bed faces diagonally toward the window wall and exterior views. Several large light wells penetrate the volume of the medical center to provide access to light and views for staff as well as patients. Unusual in U.S. medical facilities, abundant daylight throughout primary use spaces allows occupants to keep track of the time of day and the weather and to get a sense of the outside world. It also helps save energy by avoiding some of the need for artificial lighting. Indoor air quality has been a primary concern. Materials have been selected for their low pollutant emissions, and coatings have been chosen for their low VOC ratings. Potential sources of pollution are isolated with exhaust systems and airflow patterns in patient care areas provide air movement away from the patient to avoid infection and contamination. The exterior skin is a rainscreen system that reduces the potential for condensation within the wall and the potential for the growth or mold or other bacteria that might compromise indoor air quality. 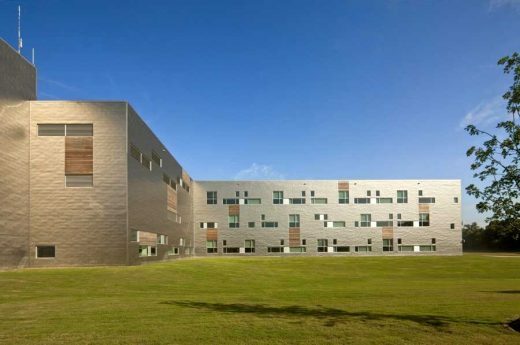 Chickasaw and other Native American culture and art influenced the development of the architectural character of both the interior and exterior of the medical center. 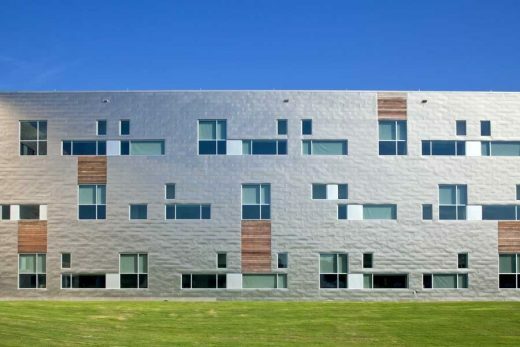 Patterns in basket weaving and textiles inspired fenestration and surface treatment of elevations as well as cabinet details and tile configurations. A very particular Chickasaw beaded necklace provoked the faceted treatment of most public parts of the building as well as patterns in terrazzo floors and concourse ceilings. Traditional Chickasaw colors with spiritual and cultural meaning provided the springboard for color selection throughout the building. Materials were chosen for their local and cultural significance as well as for their sympathetic colors and textures. Native Oklahoma fieldstone is used in public spaces both inside and outside, contributing a rich palette of tan, brown, red, ochre and gray. Weathered copper is used in conjunction with the stone. Private spaces are coded on the outside with less monumental materials—aluminum and wood. The aluminum panels are configured so as to revel in their thinness as sheet metal and to pick up reflections of light and landscape that varies at different times of day and different seasons of the year. The composite effect is a building that is strongly tied to its site, region and local culture. This is not a generic healthcare facility but a very specific response to particular conditions. It eschews the widespread practice of creating anonymous machines for healthcare in favor of making a place that can support all of the technology and sophistication of modern medical practice, but in an environment that is also full of meaning and humanity.